Renal colic is an diagnostic entity emergency providers see almost every shift, often cited as the “worst pain imaginable”. Here, Dr. Landreville takes use through an evidence based update so that we can provide the best possible care to these patients. Suspected renal colic is a common complaint resulting in an estimated 1 million ED visits per annum in the US. Given the high prevalence of this disease, it is not surprising that it costs health care systems a lot of money. Using claims data from 25 large employers in the US, Saigal estimated that the total direct and indirect cost of kidney stones among the employed population was approximately 5 billion. Also worth mentioning is that an American survey in 2011 found no change in the rate of diagnosis of kidney stones or hospitalization despite a 10-fold increase in CT use between 1995 and 2007. Figure 1. 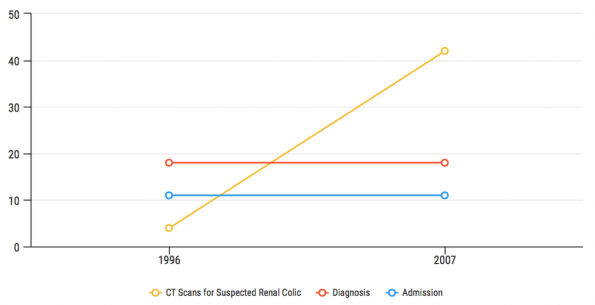 CT rate for suspected renal colic compared with diagnosis and admission. Adapted from Kocher et al. 2011. Despite renal colic being such a common presentation, there remains significant practice variation in the approach to both diagnosis and management. We’re going to take a deeper dive into the literature, and assess where some controversies may lie. Renal colic has been touted as being one of the most painful events one may experience. Thus, providing appropriate analgesia in the Emergency Department is of paramount importance. A Cochrane review in 2005 demonstrated that both NSAIDs and Opioids are effective for the treatment of acute renal colic pain. In 2015, another Cochrane review demonstrated benefit for NSAIDs over antispasmodics. The largest randomized trial ever conducted on this topic was published in 2016 and suggest that diclofenac (OR 1.49) and acetaminophen (OR 1.40) were more effective than morphine. This study was limited by the low dose of morphine used (0.1mg/kg IV) and thus was not a fair comparator. It is also important to keep in mind that the primary endpoint of 50% reduction in initial pain score at 30 min was not achieved in a third of both the NSAID and Acetaminophen arms. 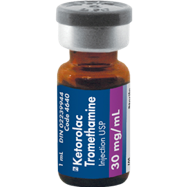 In Canada, Ketorolac is often the parenteral NSAID of choice for patients presenting to the ED with acute renal colic. So what is the best intravenous dose (10mg, 15mg or 30mg)? A recent single-centre, randomized, double-blind trial performed at a large urban ED found no difference in pain reduction at 30 minutes or secondary outcomes that included adverse effects and need for rescue analgesia when comparing 10 mg, 15 mg and 30 mg doses. This study was limited by the use of convenience sampling which introduced selection bias. Further, patients were not stratified by pain severity or condition. And finally, the use of a continuous variable pain score as its primary outcome measure weakened the methodology of this study. Exercise caution if applying to practice given the methodological flaws in this study. Also keep in mind, that our vials are single use 30mg doses and that this study does not apply to IM injection. Of note, there have been two double blind RCT’s looking at IV lidocaine for acute renal colic. Based on the results of these trials, IV lidocaine at a dose of 1.5mg/kg seems to be an opioid sparing treatment option in our armamentarium to treat renal colic pain. While interesting, these studies are preliminary and should not change practice of using NSAIDs as first line opioid sparing therapy when possible. The diagnosis of renal colic in the ED remains controversial as CT, US and POCUS may play a role based on the patient presentation. Figure 2 provides a framework on which to risk stratify patients presenting with suspected renal colic. On the right, you have your high risk populations. These patients are concerning for either a stone emergency (such as a septic stone — see table 1) or are high risk for another important alternative diagnosis, and in this population CT imaging is likely the best management strategy. In the middle, we have a group of patients who have no features of stone emergency and are considered low risk for another alternative diagnosis that could be missed by US. In this population it would be reasonable to get a radiology performed US or POCUS based on your comfort level. On the far left is the group of very low risk patients who appear well and likely have an MSK cause of pain or typical recurrent uncomplicated stone pains. In this group it may be appropriate to perform no imaging at all. Keep in mind the approach outlined in this very low risk group is not supported by any trial evidence. Figure 2. Proposed diagnostic imaging algorithm. Adapted from Wang 2016. Table 1. Stone Emergencies. Adapted from Wang 2016. The big take home is that the ability of CT to characterize stone size and location in the ED is not routinely necessary, and this imaging increases costs, incidental findings, length of stay, and the risk of malignancy. CT should be reserved for patients who would most benefit by increasing diagnostic certainty for other clinically important diagnoses or those with features of stone emergency (Table 1). Throughout the years, several drugs have been considered for medical expulsive therapy including calcium channel blockers and steroids. At present, alpha blockers such as tamuslosin have become the favoured drug largely in part to a Cochrane review published in 2014. Alpha blockers are officially approved for the treatment of benign prostatic hypertrophy but have been used off label as medical expulsive therapy for many years. The physiologic basis for this treatment is that alpha antagonists inhibit contraction of muscles within the ureter preventing spasm and allowing for an increased rate of stone propagation. While the evidence surrounding tamsulosin for medical expulsive therapy is controversial, a recent double blind RCT and subsequent meta-analysis have demonstrated increased stone passage in patients with large (5-10mm), distal ureteric stones (NNT = 5). But, despite increased stone passage in this sub group, no high quality studies have found any difference in interventions, pain, or analgesia requirements. When considering prescribing tamsulosin for medical expulsive therapy, I recommend using shared decision making with your patients, especially if stone location and size unknown. Fwu C-W, Eggers PW, Kimmel PL, Kusek JW, Kirkali Z. 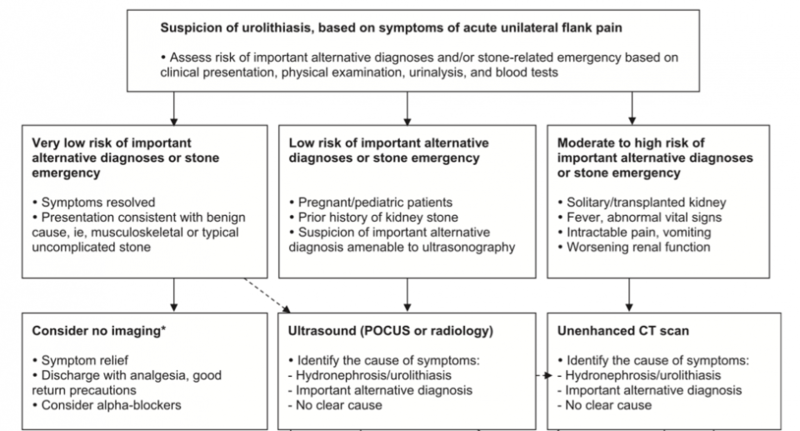 Emergency department visits, use of imaging, and drugs for urolithiasis have increased in the United States. Kidney Int; 2013;83(3):479–86. Saigal CS, Joyce G, Timilsina AR. Direct and indirect costs of nephrolithiasis in an employed population: Opportunity for disease management? Kidney Int; 2005;68(4):1808–14. Kocher KE, Meurer WJ, Fazel R, Scott PA, Krumholz HM, Nallamothu BK. National trends in use of computed tomography in the emergency department. Ann Emerg Med; 2011;58(5):452–462.e3. Pathan SA, Mitra B, Straney LD, Afzal MS, Anjum S, Shukla D, et al. Delivering safe and effective analgesia for management of renal colic in the emergency department: a double-blind, multigroup, randomised controlled trial. Lancet; 2016;387(10032):1999–2007. Motov, S, Yasavolian, M, Likourezos, A, Pushkar, I, Hossain, R, Drapkin, J, Huang, F, Filk, N, Homel, P, Fromm, C. Comparison of Intravenous Ketorolac at Three Single-Dose Regimens for Treating Acute Pain in the Emergency Department. American College of Emergency Physicians; 2016;1–8. Firouzian A, Alipour A, Rashidian Dezfouli H, Zamani Kiasari A, Gholipour Baradari A, Emami Zeydi A, et al. Does lidocaine as an adjuvant to morphine improve pain relief in patients presenting to the ED with acute renal colic? A double-blind, randomized controlled trial. Am J Emerg Med; 2016;34(3):443–8. Soleimanpour H, Hassanzadeh K, Vaezi H, EJ Golzari S, Esfanjani RM, Soleimanpour M. Effectiveness of intravenous lidocaine versus intravenous morphine for patients with renal colic in the emergency department. BMC Urol. 2012;12(1):13. Wang RC. Managing Urolithiasis. Ann Emerg Med; 2016;67(4):449–54. Furyk JS, Chu K, Banks C, Greenslade J, Keijzers G, Thom O, et al. Distal Ureteric Stones and Tamsulosin: A Double-Blind, Placebo-Controlled, Randomized, Multicenter Trial. Ann Emerg Med; 2016;67(1):86–95e2. Pickard R, Starr K, MacLennan G, Lam T, Thomas R, Burr J, et al. Medical expulsive therapy in adults with ureteric colic: A multicentre, randomised, placebo-controlled trial. Lancet; 2015;386(9991):341–9.